How to Apply for PGPM/ MBA? 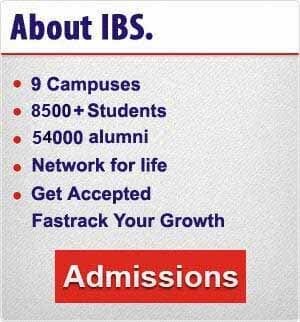 The application form is common for admission to MBA/PGPM program at IBS Ahmedabad, IBS Bengaluru, IBS Dehradun, IBS Jaipur, IBS Kolkata and IBS Pune campuses. PGPM bulletin is available at our marketing offices. You may locate your nearest branch by clicking the above link and purchase the Bulletin by paying the requisite application fee in cash. Candidates who have qualified are called for the selection process at IBS Ahmedabad, IBS Bengaluru, IBS Gurgaon, IBS Dehradun, IBS Jaipur, IBS Kolkata, IBS Mumbai , IBS Pune and Hyderabad City in April 2019. The selection process comprises of Group Discussion and Personal Interview. The fee for the MBA program at IBS Dehradun and IBS Jaipur campuses is Rs 5.67 lakhs. The fee for the PGPM program at IBS Ahmedabad, IBS Bengaluru, IBS Kolkata and IBS Pune campuses is Rs 8.01 lakhs.